The Rule of Threes struck again, and it struck with a vengeance, especially today. I remember as a kid, when a celebrity or notable person would die, my Dad would say, “Well, two more to go – they always go in threes.” He was always right. Somehow, another notable person would die, and then another, and the three were chosen. This never became more apparent to me in 2006, when my family suffered three losses — first my cousin Arlene, then my Dad, and then my cousin’s Grandma Madge. The Rule of Threes was most painful that year. When Farrah Fawcett died today, I posted a tweet on Twitter that said, “Rule of threes – Ed McMahon, Farrah Fawcett… will Walter Cronkite be next?” It seemed to make sense. Just days earlier, news reports stated that Cronkite, the veteran news reporter, was “Gravely Ill.” I didn’t realize at the time just how wrong I could be. I never expected Michael Jackson to be the one to round up the Rule of Threes, and certainly I never expected it to happen that same day. Well, for one thing, each of them reminds me that I, myself, am growing older. The heroes and idols and superstars that I remember from my youth are quickly fading away. I look at their careers and wonder if they lived happy lives, good lives, fulfilling lives. Some did… some had harder times. 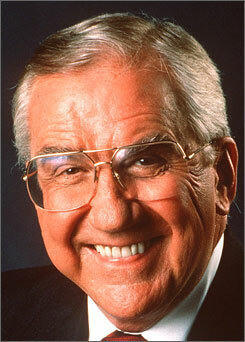 Ed McMahon lived a long, full life. He had many careers – military, music, entertainment… he seemingly did it all, and did for a very long time. As memorable as Johnny Carson was, so too was Ed and his hearty laugh and his legendary introduction to the Tonight Show, “Heeeeere’s Johnny!” Many nights I can recall laying in my bedroom trying to sleep while my parents were in the living room watching Johnny walk onto the stage through the rainbow-colored curtain after that hallowed call. Then when I got old enough, I, too, enjoyed Ed and Johnny’s antics. They were friends of mine too. And now they’re gone. Farrah Fawcett, with her windswept, dirty blonde locks, was every boy’s fantasy… even a burgeoning gay boy like me. I can’t deny that I wasn’t fascinated with her– I was. She got all the men, and she did it all with the flip of a feathered lock. But there was much more to Farrah than “Jiggle TV” showed, and she knew it. She knew she had the talent to make a name for herself, and stuck up for herself to prove it. She was a survivor, and a fighter. Those truths about Farrah don’t come out often enough, and I hope they do now, because she needs to be remembered for all of her accomplishments. Her final fight, cancer, was probably her greatest. Angered by tabloid trash talk about her disease, she decided to the turn the cameras on one last time, and tell the truth… and she did so with amazing dignity and perserverence. I watched “Farrah’s Story” and was moved by her bravery in the face of death. She knew– she HAD to know– that her end was coming, but she wasn’t afraid to tell the world that she wasn’t afraid. So she kept on fighting, right up until the end. Ryan O’Neil said he loved her more than ever during those months… and I have to say that I did too. Rest well, Farah… you’re truly an Angel now. But Michael Jackson was the greatest shock of all. Poised for a comeback after many years out of the spotlight, which was rare for the superstar who had been in the spotlight since he was a very small child; it looked like Michael Jackson was on the road to recovery after the trials and accusations that faced him just 4 years ago. There is no sense judging him for all of that now. That isn’t my place, anyway. I want to focus on the brilliant music he made, from his meager beginnings with the Jackson 5 to his incredible years with Off the Wall and Thriller… and his countless charitable and humanitarian works. Michael Jackson may have become a persona later in life, and his odd behavior turned off a lot of people; but most of those who were turned off by the oddities agreed– the man knew music. The King of Pop? Maybe an overblown title… but he sure as heck sold it the best way he could. He truly was a legend, and I’m still stunned that he’s gone. Each of these legends… icons… were present in my youth and adolescence. And now they are gone. Life goes on, but it’s a little sadder than the day before. Who you going to kill next, Mr. Killer? I don't know what I'm going to do, I was growing my hair out so I could feather it like I did in the 80's to show my support for the struggle that Farrah was going through….but now I don't know what to do with my hair….maybe I'll just shave it all off!